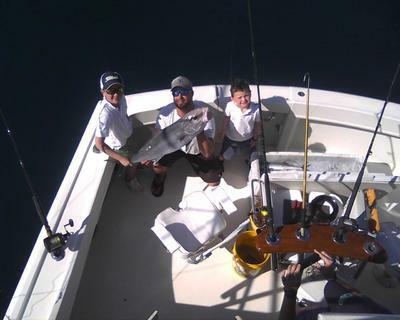 Travis booked us for a half a day fishing in Ft. Lauderdale aboard Marlin My Darlin and the focus was on making it fun for his two boys Will and Parker. Will is 9 and his little brother Parker comes in @ 5 years old. Lots of junior anglers the last couple of weeks with Spring Break. Captain Kopper at the helm today and that?s a good match as he enjoys junior sized anglers and really applies all the tricks he has gleaned out of fishing out front here for over 35 years to bend those rods. Mother Nature gave us quite a nice day today. Sunny and mild, not too hot due a slight onshore breeze to take the edge off the heat that comes with a full sun here in South Florida. Current running slowly to the north and clean water as Travis and the boys cleared the inlet on the way to the reefs. Bonito and Mackeral today to go along with that nice Amberjack in the photo, the largest fish on the charter. That Jack took a live bait that was fished right on the bottom at a shipwreck in just over 200 feet of water. Spin rod and 20 pound line, ?Reef Donkeys? always a good powerful fight, especially when the anglers are young.